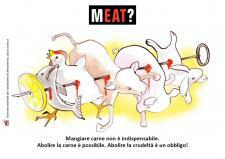 We are organizing a street performance for the abolition of farming and slaughtering. We will have a street performance to raise public awareness of the daily massacre held daily in farms and slaughterhouses so as to provide food for human beings. 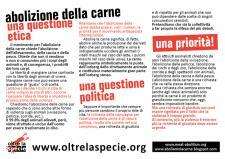 Because we think that asking people to change their consumption habits (becoming vegan) is not sufficient,we are asking for the abolition of farming (just like for vivisection or fur production). We are looking for activists for the performance. If you are interested, please contact us at 335-83767556.